This story first appeared here. Connect with Mary at @mary_teaching! #5: Intellectual dependence → Put students in the driver’s seat as often aspossible, from planning their day to self-regulation (see more details). #6: Provisional self-esteem → Implement Student-led conferences &blogging to allow students to clearly recognize and share their own learning. We will know we’ve been successful as educators if a student we taught can at age 30 pursue any option in life they desire — Ira David Socol. As teachers, it seems the system measures us by the “success” (see standardised test scores) our students achieve while in our care, but perhaps the truest measure of an educator should be defined by the number of options our past students have available at age 30. What job opportunities exist for them? What kind of adults/partners have they become? What kind of parents may they have turned out to be? Do you ever pause to wonder about your past students? As I prepare to farewell my current crop of young learners, my mind has drifted to students of years past. Where are they now? Did I have a positive impact on their lives? Did I help steer them towards finding their purpose in life? Do they remember school fondly? Jack*, a former student who has just finished high school, popped into my room recently for a visit. While we were catching up, he shared that I had been his “best” teacher. I made a “did you drop out after year seven?”wisecrack, but I was humbled to hear it. And shouldn’t this be our aim as educators? To be that teacher? We all have them. It’s rarefied air to belong to the select group of educators that another person carries around with them for the rest of their days. I had some amazing teachers over the years, but large chunks of my school experience were still pretty miserable. The recurring theme on my report cards growing up was “he has the ability, but needs to apply himself”. Actually, what I needed was learning that had meaning. What I needed was a sense of purpose and control. I needed to move & create. I needed adults who believed in me. Deliver the best curriculum content the world has known and it won’t rate a mention against the educator who believes, who champions, who sees the potential of a young person and inspires them to pursue their purpose and passions above all else. This got me thinking about the experience Jack had in my room as opposed to his sibling who I’m currently teaching. Seven years ago I was a very different teacher. I epitomised teacher-centred practice. I decided what content and skills mattered and how each would be measured. I created the assignments and assessments which were completed in lockstep. I wielded strict deadlines, zeroes, and a trove of one-size-fits-all summative assessments to keep kids “accountable”. I got really good at getting kids to do my learning, now I’m trying to get better at helping kids find purpose and meaning in their learning. Even though I cringe when I recall many of my past methods, my classroom wasn’t a bad place for kids and I wasn’t a bad teacher. Jack is a testament to that. I just had a lot of unlearning to do. I still do. Early in my career, I was mired in the left-hand columns of this continuum. EdPartnerships International: I think graphics like this can be valuable for educators who want to create more opportunities for student agency, but don’t know where to start. Every educator offers a different experience and it’s this diversity which creates rich learning environments and school cultures. There is not one best way to teach and educators should be allowed to stay true to their authentic pedagogy. But to paraphrase Monte Syrie, one end of this spectrum relies heavily on compliance, the other end relies on commitment. Doing school tokids is easy. Doing school with kids, that’s where the artistry of teaching comes in. Many teachers equate developing opportunities for student autonomy, purpose and meaning to “letting ’em do whatever they want”. They can’t fathom how student-centred learning can be rigorous, challenging and engaging. During a recent podcast (Things Fall Apart: Human Restoration Project, S2: E18), Tony Wagner, suggested that when it comes to innovation, teachers are highly risk-averse. According to Wagner, we “teach in the ways we’ve been taught, it’s not our fault, it’s all we know” and “you’re not going to change your teaching because you’ve read a book…or seen a movie”. I agree that educators are unlikely to find their “why” for change in the pages of a book, but the rest of this quote, I’m not so sure about. My school experience mostly served to inform the type of teacher I didn’t want to become. We have to overcome the limitations of our own experiences if we are going to transform school for all learners. We could change nothing and a large percentage of students who play the game of school just fine will find success and purpose in life. But all means all. Be that teacher. I thought I was doing everything “right”. I had prided myself on unpacking standards, planning engaging, performative lessons and units that were well-paced and tech savvy; putting together complicated, ambitious projects and writing prompts with standards-referenced, multiple-tiered rubrics and criteria for students to meet or exceed. Yet my journey to student voice and choice in the classroom was born out of an intense frustration that what I and my co-teacher were spending hours planning, and daily troubleshooting, just wasn’t having the impact we were intending. Students frustrated with technology, bored with a topic, or just not feeling like learning about the Reformation for three weeks would act out, speak out, lash out, just anything to get away from a classroom that, now, so obviously demanded that students care and learn about and think important what I, an adult with a history degree and a shelf full of history books, cared and found important and demanded they learn about. It turns out that, if you let them, students will partner with their peers to research, create, and send a presentation to the school board about Eurocentrism in our history curriculum (and fume over the board’s complacent response). Students will teach a lesson to their peers about the technological advances of the Roaring 20s, complete with a pre- and post-quiz Kahoot to demonstrate their classmate’s learning, if you let them. Students will blog openly about controversial and deeply personal topics, post their work to an online audience, and solicit feedback from friends and strangers alike, if you let them. This kind of problem-solving questioning is how I learned to make molasses cookies and the same line of questioning that put human beings on the Moon. Too often, student voice and choice is singled out as an idealistic pedagogy, but it turns out that this simple set of questions can be used as a lens to look at almost any issue, topic, or problem imaginable, and with that set of questions came the simple but powerful permission to imagine. I couldn’t let grading and evaluating and points and what was exceeding versus meeting and not-quite-there-yet interfere with deep, meaningful student learning because it didn’t matter what the rubric said or what the levels were: students were more motivated to learn, were more engaged in their learning, and sharing in their learning together in a way that hadn’t existed in my classroom before. So how did I grade all of this? Well, I didn’t, really. I didn’t need to, and I couldn’t let grading and evaluating and points and what was exceeding-versus meeting-and-not-quite-there-yet interfere with deep, meaningful student learning because it didn’t matter what the rubric said or what the levels were: students were more motivated to learn, were more engaged in their learning, and sharing in their learning together in a way that hadn’t existed in my classroom before. I went from being a micromanager of student behaviors directed at teacher-focused outcomes, dreading each class period and waiting to see how these students could screw up my lesson plan, to a learning partner, sharing in the joy of learning with students, talking openly with them about their learning with no evaluative agenda, and learning alongside and from them as a result. I did less, students did and learned more; we were happier and had a healthier classroom culture. I did less, students did and learned more; we were happier and had a healthier classroom culture. When I first left my teacher training program and joined the “real world”, I was accompanied by myriad papers to guide my quest of inspiring new thinkers. Drilled into my brain were the concepts of differentiation, student choice, and formative/summative assessment. My reigning document was a salmon, double-sided wall of text which was comprised of tech tools, artistic endeavors, discussion types, and more to engage and excite students. Routinely I went home to diligently plan each lesson, connecting at least two standards (from both Common Core and social studies), selecting at least one new tool from the toolbox of my document. As far as I knew, this was “great teaching” — not only had I known my students “were learning” but often my lessons were engaging and at least better than what I remembered in school. However, the more I reflected — and most importantly, the more I listened to what the majority of students actually felt about school — it seemed my exhaustive nights of planning were going to waste. Was it really that engaging to fit in “cool” technology or was I simply masking something students didn’t really want to do? I felt I was designing the airplane to feed my students peas and carrots. It was a faux choice: by giving my students the opportunity to select “interesting” ways of doing their work, I neglected the choice of doing said work. (And it is telling that we tend to define “disguised tasks” as “work” rather than “learning.”) Why can’t students choose what they learn? Choice is more than fitting options into a curriculum, it is a reimagined system of education — one that replaces the traditional teacher-led dictatorship into one of democracy. At its core, democratic classrooms provide students with authentic power — not the safe “choice” of what task they’ll complete by the teacher that day. This transformation is as daunting as it is unrecognizable to most schools. To give away your power as an educator is a terrifying feeling. After all, most classroom settings are fundamentally shaped by compliance — a teacher assigns work, students do said work, a teacher grades and returns it. Even when given some freedom, there is a common understanding that the teacher commands — no matter the task, a teacher will ultimately decide the outcome, including giving the power (temporarily) to students to choose that outcome for themselves. Deborah Meier engaged in a democratic classroom at Central Park East in the 1960s. Philosophically, there is a major problem with the teacher/student dichotomy: exposure and discovery are much different than listening and complying. Although a student may take away some knowledge, the lack of choice, self-actualized applicability, and credence to further inquiry destroys the process of natural learning. Of course, entire school networks operate democratic classrooms, from self-directed education centers to Alternative Schools such as Deborah Meier’s Central Park East project. These schools were built with student empowerment in mind, but what about the vast majority of traditional buildings that aren’t? Is it possible to have a democratic classroom or even school transformation? Universally, these frameworks allow students voice. The framework systemically outlines how students present their voice and provides near universal ways to do so. After all, how would one know what students want if they’re not listening to them? Given all this, common reactions one might have is: “won’t students just play games all day?” “how will they pass the test?” “I’m a professional, students need to learn from me!” Ingrained in many mindsets are children not capable of learning on their own nor having the maturity to do much at all. Placing students in a compulsory, “no nonsense” setting for years of course has manifested this. There’s no denying that older students would have difficulty adjusting to this system — but that’s not a strong argument to dismiss it. After all, students brought up in these systems are more than capable of critical, open dialogue on designing their education. Do we not owe it to our students to acknowledge and build structures that permit their learning rather than what we want them to learn? It isn’t always in line with content standards or standardized testing. We know testing isn’t a valid measure of intelligence. (Most I’d argue could not pass tests given to their students in other subject areas. I know I would fail math and likely, science.) Furthermore, it is difficult to pinpoint the relevancy of many content standards. All things considered, it’s not that students will completely dismiss everything. Children — especially those not disenfranchised by schooling — find a lot of what is typically traditional schoolwork exciting: books, lab experiments, robotics, historical reenactments, and much more. People naturally want to learn, grow, and develop. We know this as it’s human nature, but further obvious proof is that democratic schools already exist — and they aren’t 24/7 Fortnite centers — they’re filled with exciting projects, discussions, and even (opt-in) traditional coursework. Core subject areas are interesting in many ways, but when students are forced to do everything their intrinsic desire to learn is often lost. It’s not that they don’t care about the teacher’s subject, they just disregard how the curriculum forces compliance. And surely many will ignore many aspects of traditional subjects and gravitate toward those deemed less important by the testing industry (and therefore, schools): art, music, theater, and many others. 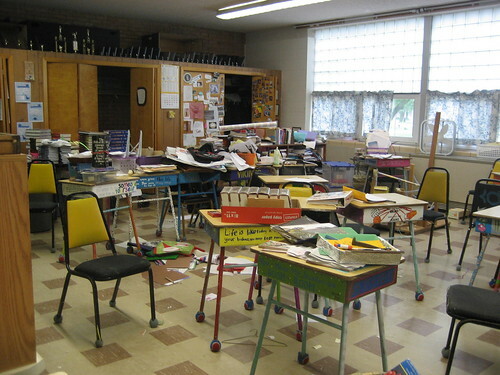 Furthermore, chaos is not normal for a classroom embodying freedom. Perhaps if no structures are in place — if students aren’t involved in planning nor have a clear understanding of what their place is — it may happen (a Lord of the Flies moment.) But as stated before, students thrive in open learning environments. And no, a teacher’s role is not lost. Yes, one will earn respectrather than assume it, but children still see an expert in the room. Usually, students want a teacher to provide them with lessons, even voting to give them power on what to do next. Sometimes classrooms just look like traditional classrooms. However, the incredibly acknowledged differentiator is that students chose this for themselves — it is remarkably different than a prescribed list that is handed down. Dismally, creating these structures go against most school policies. Accepting this transformation will likely mean students are not prepared for traditional tests — which ties to funding and is realistically very important. If a teacher adopts this solely, they will more often than not face the wrath of administrators who see this as an act of rebellion, and many teachers will disparage their actions as “bad teaching.” Just as a democratic revolution of the classroom involves student empowerment, the process of getting there requires teacher empowerment as well. They must demand change through banding together, presenting their ideas, and even possibly making threats. Revolution isn’t safe — all major changes require sacrifice. For most, I fear this isn’t possible — encouraging a group of teachers to look into experiential learning is already a tough task in many areas, let alone banding together and starting a freedom revolution. But again, any step is worth it — even if it’s just in your classroom. How much of a mitigated risk can you take and give power to your students? How much “creative manipulation” can you enact to “pull things off” at your school that administrators and state watch dogs may not know about? I hate to promote deceit — but revolutions are started by those willing to do whatever it takes, often in the shadows. Explain to students the “what” and “why” of what you’re doing. Having the classroom on your side cannot be understated. Establish some form of daily meeting where students are free to talk about what they’re learning, what they want to do, or anything they’d like to change. Importantly, students actually have control. As a teacher you can still have suggestions, but it’s imperative that students don’t think (or worse, actualize) that you have the final say. Reinforce to the point of near-monotony that students can choose what they want to do. Students need to be reminded that this isn’t traditional school — they can change course, work together, vote, and speak up at any time. This may be more structured at first (e.g. calling for a class vote), but providing every opportunity — developing that framework for democratic voice — is paramount. Accept that discipline and grading will look different. A student may choose to never do anything at all. This shouldn’t be seen as a sign of disrespect or unwillingness to learn — it’s guaranteed that this student has deeper troubles that need to be explored further. Don’t be afraid if the class is “off-task” at times. Learning isn’t passive nor silent. I’ve never seen a teacher utilize all their planning time without goofing around or browsing Instagram. (In general, we need to rethink education as “tasks” and “work” and recognize learning is a constant, blossoming process. It’s not being “off-task” — it’s waiting for thoughts to gather, relaxing, and possibly learning something else.) A class may decide to do nothing at all on certain days. I’ve had a class play Jackbox Games all period…and the next day we had one of the most in-depth, focused discussions I’ve ever heard. Transparency is key. Nothing brings a classroom together like leveling — especially a teacher to their class. If I know that we have to do something on a certain day or else I’ll certainly be fired, I’ll tell my students exactly that. If we must hit certain points in the curriculum or the school will be shut down, I’ll let them know up front. If you treat students with respect, they’ll respect you in return. It isn’t disguising anything, it’s facing an actual dilemma that you solve as a learning community. You’ll likely find that older students are perplexed or humored by these ideas. They’ll feel it’s either a trick, a farce, or an opportunity for exploitation. I remember a time when I allowed a classroom of seniors to make their own rules and the first suggestion was to start each class with a whistle (for no apparent reason outside of the ridiculousness of it. *Interestingly, this lasted every day of the semester and students would be upset if we forgot the whistle, even going to lengths to restart class if warranted.) Silliness, weariness, or even indifference shouldn’t be surprising. And we can’t tell students to “take it seriously” — doing so is reinforcing that we’re at the front of the room, commanding on how to do everything. If we prefabricate what our room will operate like, that defeats the entire purpose. Students have been taught that the adult is in charge and school is supposed to be this way. Heck, the majority of my students initially want me to just make all the rules and curriculum decisions. However, by opening the door to democratic participation — students will take steps, just as you did, into the realm of inquiry and intrinsic learning…even if it’s just a few times. Therefore, moving to a democratic classroom can be as large of a leap you’re willing to take. From letting students speak openly about what they’re doing to transforming an entire school to let students vote on policy decisions, any step we take to the change the mindset of compulsory education is worth it. For far too long we’ve accepted the status quo of stand-and-deliver passive classrooms. We can make learning matter, so why the masquerade of trivial work? Let’s move toward a system where students care about what they’re doing because they want to do it — not us. Technology envelops a classroom: full of iPads and laptops; all students have access to augmented reality contraptions and virtual reality headsets; a group of students is being led in a coding session in C++; flexible seating arrangements allow for everyone to feel comfortable; students submit work through an advanced online LMS; students connect with peers via webcams. In most cases, one would describe this scenario as an innovative classroom — by using the most advanced tools, we’ll effectively prepare students for the future. Well-to-do educators promote their use of the latest coding app. to get students interested early on — even offering credit as second language! Companies are propping up everywhere to offer new flexible seating solutions. Each of these improvements come at a gigantic cost. However, all this is hardly innovative. What do these tools do but allow us to do “old things” better? We’ve transitioned from paper and pencil worksheets to an iPad for math homework, but discourage, block, and don’t modernize in the age of Wolfram Alpha; we no longer need paperback books for the whole class and encourage eBooks, but don’t allow students to read whatever they want from vast online catalogs (including audiobooks! ); we push coding as innovation, but ignore that the future will have something new to behold. Every time we propagate innovation as technology improvements, we’re ignoring the vast changes needed in the education system as a result of technology. Most information learned in school can found in the blink of an eye — and most rote knowledge has been replaced (or will soon) by artificial intelligence. Why would we not change the entire math curricula now that machines can solve almost all high school math equations? Of course, many teachers would respond: “so they understand the process” — assuming that students understand this from regurgitating step-by-step instructions. Rather, we could develop a math curriculum that uses these tools to creatively solve real problems. Reframe math as a relevant and authentic skill by using tools available to solve and think about real world problems (such as personal finance decision-making and building). Work with local research firms or organizations to study and predict real data in science. Be given ample time to read for pleasure from a vast array of media in English. Navigate complex issues, be empowered, and understand the past using purposeful discussion on tolerance and activism in social studies. Utilize technological tools to assist learning a second language. Save coding (and other extracurriculars) as passion-based classrooms focused on students who want to learn more (of course — all classrooms should be framed with this in mind). Large amounts of time given to flexible, self-directed learning. Students are given a variety of options — such as laptops, books, and activities — to develop their own projects. Students are not confined to one location, and are taught responsibility by acting freely. Cooperation and collaboration are encouraged through students being empowered to organize activities and tackle greater objectives. The school (and its students) work with the local community to bring in professionals to assist in teaching, learning, and partnerships. Teachers assist students in finding their passion and purpose in life: devoting the majority of their time to one-on-one or small group sessions to build relationships and mentor. Instructional time, beyond simple arithmetic and literacy, is devoted to teaching students how to learn through finding and organizing information — as well as teachable moments in tolerance, empathy, and communicative skills. Students are constantly learning by doing. There is little to no time being devoted to lectures — unless prompted by students or general housekeeping. Discipline is through elements of restorative justice — all infractures are based on talking with everyone and making it a learning experience. There are no “zero tolerance” policies. Administration is open and present — connecting with teachers and students — and constantly providing support. There is no homework. If a student wants to learn more (which they most likely will when not being drained nor disparaged by traditional schooling) — they will. Teachers model a love of learning by actively reading and encourage mindfulness through constantly reflecting and taking breaks. There are no grades. A school is a place of learning: not competition. Students will learn without being pitted against each other. Assessment still exists in the form of constant feedback and narration between teacher, student, parent, and community. Above all, a student’s happiness and safety are what’s most important and emphasized. These aren’t easy solutions. Innovation isn’t an easy task…it requires risk and determination. “Grit” — as it’s often used in the classroom — is not about doing what you’re told and pushing through (despite hating it), it’s pushing through a daunting task that you want to accomplish, even when faced with adversity. Adopting innovative tech tools are actually very simple: in fact, it’s not really innovative at all. It’s just three things: 1) finding out about them, 2) purchasing them, 3) reading instructions. That’s not to say technological tools aren’t useful (of course they are, a lot of progressive practice are amplified by them!) — it’s just that their purpose being changed for a modern education is when the going gets tough. We need to stop focusing so much energy on improving outdated practice. So much time and money is wasted on hatching out the newest “trick” to solving the education crisis — without taking the time to question the system we’re using. And yes, it is possible to change that system — schools throughout the country have already taken the plunge towards invigorating learning. Organize and politely demand action through comradery, research, and determination. It doesn’t have to be all at once: every aspect we adopt and implement is to the betterment of children’s lives. How do schools expect students to develop ethics: responsibility, tolerance, acceptance, cooperation, trust — if they refuse to usher in school policies that allow for it? Anyone in education would state that responsibility is a key notion to teach children, whether in elementary or high school. But, how does a school go about this? Typically, it is by restricting access to whatever a student could do irresponsibly. It is not acceptable for a student to perform any irresponsible actions; therefore, they should never have the ability to do them. Doesn’t this just encourage students to be irresponsible — just to see what it’s like — when there aren’t rules governing over them? When students use their phones in class, they play video games! Okay, let’s enforce a no cell phone rule! Students spend all day watching YouTube videos in my class. Install a web filter that blocks most websites. Kids are skipping class! Design a hall pass system where students can never leave the classroom without explicit monitoring. Students are “goofing off” when given work that requires movement in the school. Ensure that all students are constantly accounted for in a set, small space. Double check attendance often! A student does something heavily against school policy(smoking, dealing drugs, sexual activity) while out of class. Red alert! Shut down the entire school. No students can do anything anymore! Do note, I’m not stating that rules should not exist, instead — I believe that students should be taught the conscious decision to make good choices. Will this lead to more students making improper choices? Probably. I would argue that most students would do these things irregardless from policy via web filters or just skipping class. However, what about students who are deterred by these rules? Are they actually learning responsibility or just terrified of the ramifications? This has a direct parallel to parenting. Parents who tend to reinforce strict rules and guidelines usually almost manifest some of the most rebellious actions by their children. Or, their children grow up and take a “rule-breaking” action (i.e. smoking) and realize that nothing happened! That must mean…all these other strict rules have no purpose! Because no one in this equation ever learned responsibility: how their actions have consequences — for them and possibly others — they don’t know why their making these decisions. This obviously applies to school as well: if a student does something improper on their computer — what a great time for a discussion on proper Internet usage — how it would impact your job performance, your digital literacy, even your Internet bill! If a student is running through the hallways and breaks a student’s project in their moment of exuberance, then it’s time to teach apologies, personal accountability, and moments of reflection. The point is, without an opportunity to fail, you can’t have teachable moments. It’s the same as writing a paper for a student in English class. And, of course, this has to be reinforced across the entire school. Teachers have to recognize that all students are their students. It’s not “your students” when they’re in one class — everyone in the school should want everyone to succeed. If you see something, you can teach it — we’re equally responsible for everyone. Administrators also need to reinforce this culture and encourage proper behavior of students and staff.